Moscow - Otkritie Arena 02.01.2015: The President of Russia Vladimir Putin has opened the third venue for the 2018 World Cup. The new stadium – Otkritie Arena is the only venue for the World Cup, which has not been financed by public money. 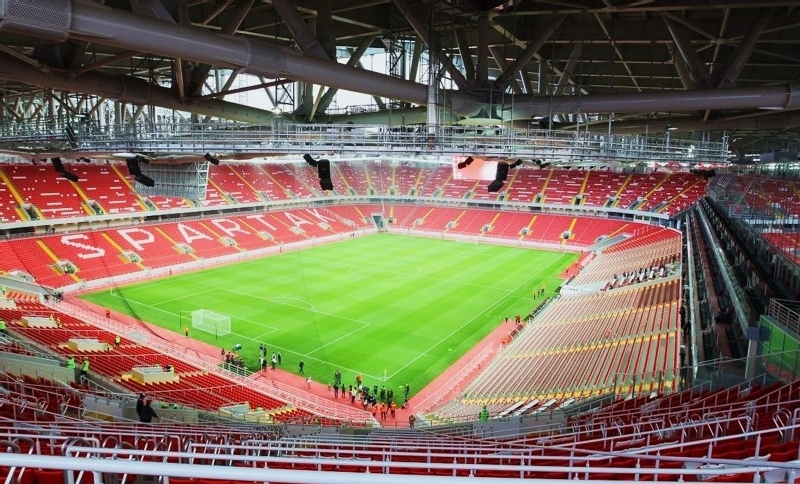 In September Otkritie Arena became the very first home ground of Spartak Moscow, which had been waiting for this to happen for years. One of the most famous Russian clubs, if not the most famous one, have been trying to complete construction of their own stadium since 1994. However, for more than ten years the plan was doomed for one disappointment after another. But when Leonid Fedun, a Russian billionaire and owner of Spartak Moscow, decided that the new stadium should be built in Tushino, northwest Moscow, his dream was more likely to come true. Although his first plan fell through, it provided basis for a second plan, which was drawn up in detail in 2009. In May 2010 construction works were begun on the site of the well-known Tushino airfield. In October the works were well under way and it was announced that the construction would be completed in late 2012. Later, this proved to be unfeasible, as the construction was considerably delayed in 2011, also due to an increased budget, which went from 340 million up to 420 million USD. However, the costs were not covered by public money but by private funds provided by the oligarchs Leonid Fedun and Vagit Alikperov. 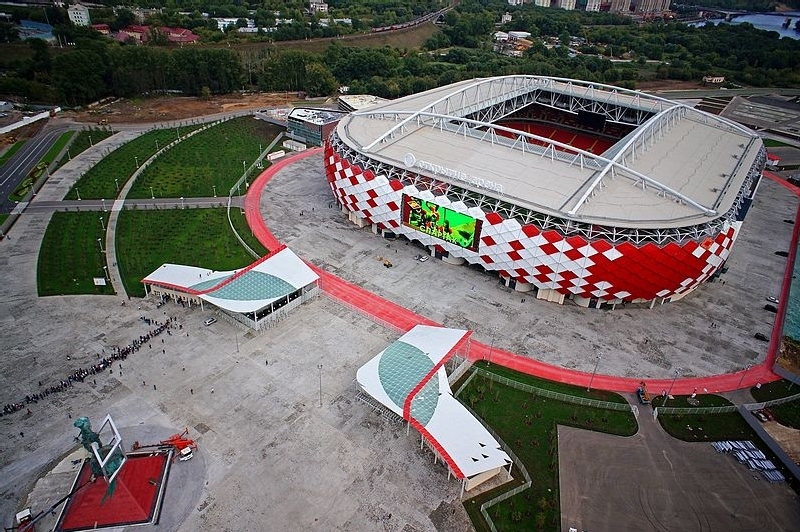 Otkritie Arena was opened on 27th August by the President of Russia Vladimir Putin. On Friday 5th September the first match was played at the stadium, between Spartak Moscow and Crvena Zvezda Belgrade. The stadium design was created by AIKOM Russia and Dexter Moren Associates. The stadium façade is decorated with red and white “fish scales”, reminiscent of the club logo and colours. There is also a huge screen on the outside of the stadium. The seats inside are red and white as well, red predominating. Only the main stand has a different design, it is completely covered with glass. The two-tier stadium has a total capacity of 42,000 seats. If necessary, the capacity can be increased by another 4,000 seats. The whole of the West stand is reserved only for partners and clients. The lower tier offers more than 5,000 luxury seats and the upper tier consists of 48 sky boxes. It is planned that six or eight training grounds will be built in the stadium vicinity. Next to the arena there will also be an indoor stadium with a capacity of 12,000 seats, to be used in freezing weather – which is a unique feature among football stadiums in the world.